We welcome back Colin after a long break. He is a fine writer and performer of songs with a relaxed style well suited for a summer’s evening. 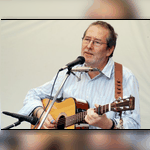 His latest CD “Where The River Bends" has garnered some very praiseworthy reviews.